The first time I saw a pair of chopines was on Catherine McCormack in her portrayal of 16th century courtesan Veronica Franco (a film which, along with La Reine Margot, occupied pretty much all of my 11th year) . 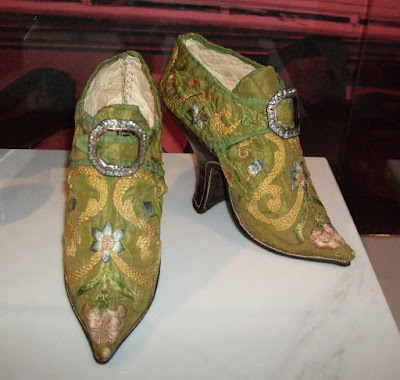 Well preserved fashions from before the 1700s are so rare that I had never hoped to see a pair of chopines with original embellishments intact, but I lucked into this silk and velvet pair from 1580-1620. I particularly like the studs decorating the base. 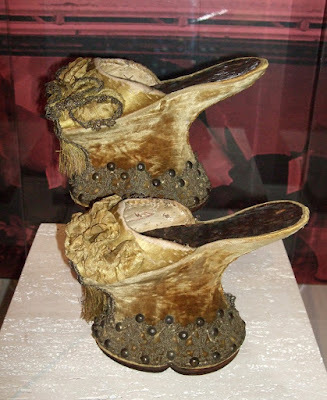 Some chopines were highly impractical, reaching heights of over twenty inches (at which point, similar to Chinese women who underwent footbinding, an attendant was required to help them move), but others were lower, and patrician women (as well as the “cortigiana onesta”, or intellectual courtesans) spent hours learning to walk and dance in them gracefully. 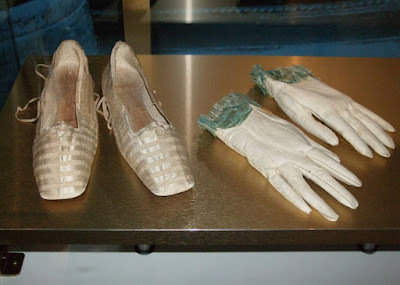 Next, slap-soled shoes belonging to Frances Walsingham, lady in waiting to Elizabeth I, and daughter of her spymaster, Francis Walsingham. Though the shoes belong to a Canadian collector, they are considered so important to British history that they have to be returned to England soon. In 17th century Europe, tulips were an exotic, luxury item that indicated high status. Variegated tulips (the kind embroidered here) were the most valuable, with a single bulb costing more than the average person made in 5 years. These mules would have been worn by a young, very rich fashionista. 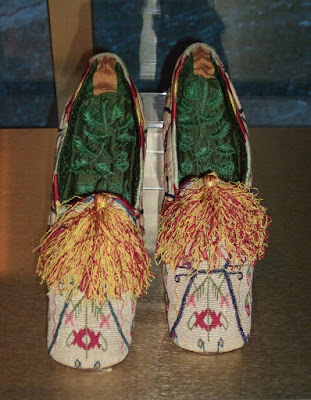 Silk, embroidered shoes from the mid 1700s - England and France. 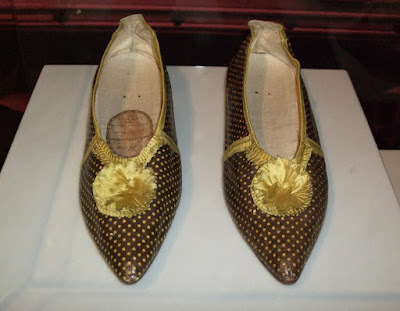 Printed leather was all the rage for women's footwear at the end of the 18th century. This pair was made in London in the 1790s- without seeing the label, I would never have guessed that they were so old! I like the polka dots and ribbon detail. Ornate kilm silk flats with silk tassels. England, c. 1860. 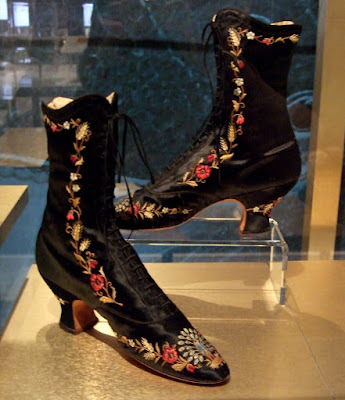 Black satin boots with a "Louis heel", embroidered with typically fashionable Victorian subjects – botanicals and peacocks. Designed by Meliès, c. 1880-1885. 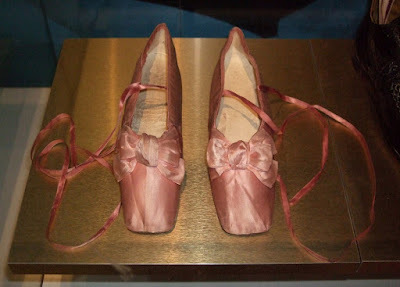 Pink silk shoes with straight soles owned by the first wife of Count Walewski (Napoleon's son). 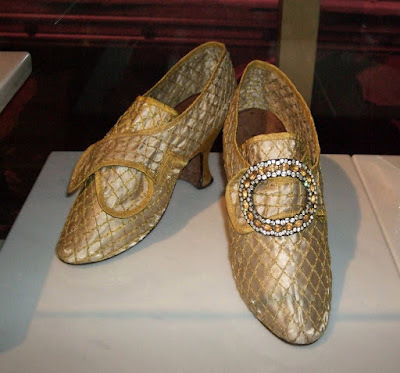 They were made by famed French cordonnier Melnotte in 1830. 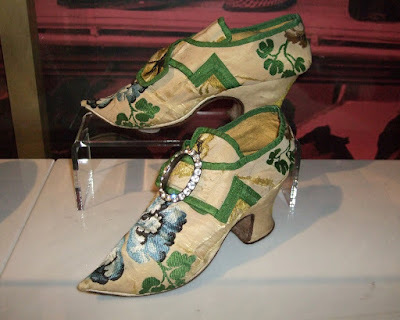 Shoes with ribbon appliqué worn by Queen Victoria in 1840. I love Adelaides. As a devout bootist, I like to imagine that my name is derived from this grandmother of the go-go. Adelaides were brought into fashion to preserve the modesty of ladies whose crinolines were jostled and swayed up to reveal a bit of leg. 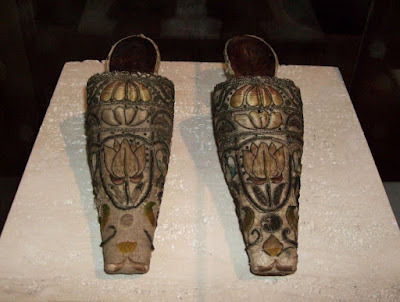 This beautifully embellished pair, however, was meant to attract attention. France, c. 1855. More photos can be found on my flickr. Posted by la femme at 7:41 p.m.
Beautiful! Thanks for the eye candy! It's interesting to see how the shapes have changed over the years, but also how little is different. Apart from the aforementioned shape and the fact that they look quite fragile, these could blend it quite nicely in a modern day shoe store. Mostly. and i see you have montreal on your itinerary for september. i may see you around without even knowing! Wow, this is amazing. Considering I THOUGHT I knew so much about fashion, I'm surprised I've never seen these shoes before. 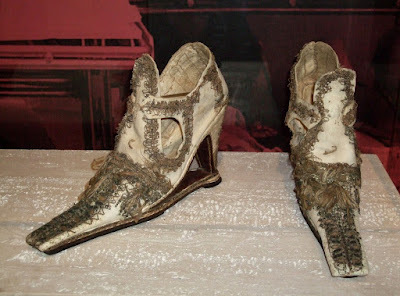 I guess I never thought that historical shoes deviated much from current footwear trends. Great entry! So true. The more uncomfortable shoes are, the more I seem to want to wear them. Thank you so much for posting, a little history lesson is always welcome! It must be difficult to walk with the first ones. my coveting of shoes has widened! I loved the little stories and historic background text displayed along side those shoes. Was the ballet shoes exhibit at the Beta over when you visited, I caught it 3 months ago, and the exhibit space was so beautiful. First shoe photo was totally weird....Well I like some of designs. 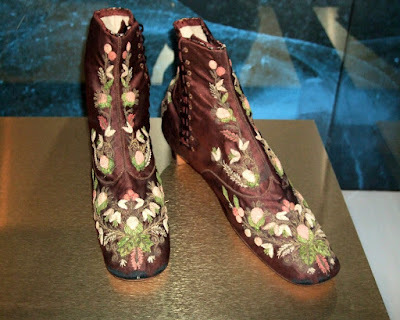 Did you see any shoes from Louis XIV? Apparently his heels were quite ornate.